Networking in the Great White North, Eh. I’d love to call Randy Seidl and ask him for an interview. The problem is, I don’t have the street cred that it would take to even make it past his administrative assistant. You see, Mr. Seidl used to work for Hewlett-Packard as their “Senior Vice President of the Americas, Enterprise Servers, Storage, and Networking”. He doesn’t work for HP any more. 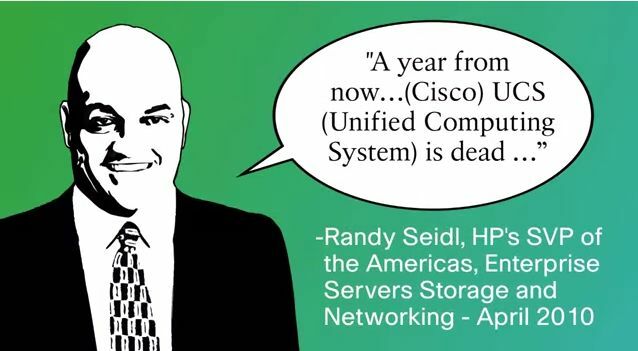 This is a quote taken from this article over at CRN just prior to HP’s 2010 partner conference, just one year after Cisco launched the UCS platform. 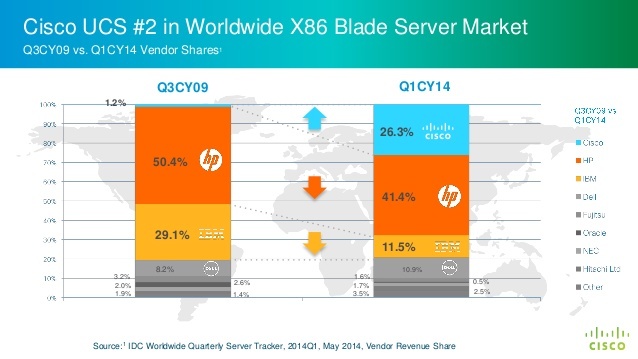 HP’s strategy at this point was to try to take market share away from Cisco in their core switching business. I suppose this was a natural response considering Cisco’s foray into enterprise servers was aimed to strike a blow at the heart of HP’s business. HP’s strategy aimed to empower their partners to offer significant discounts and trade-in allowances for any existing Cisco customers, hoping to woo them away from the teal giant. 2-for-1 and 3-for-1 deals weren’t uncommon, and it seemed HP was ready to cut off their nose to spite their face just to grab more of the Ethernet switching pie. 5 years later Cisco remains atop the Ethernet switch market with a 60.4% share. But we’re not here to talk about Ethernet switching. We’re here to talk about Cisco UCS. The official Cisco Unified Computing System press release came in March of 2009. By 2010, which marked my first Cisco Live event in Las Vegas, UCS had a lot of hype among the Cisco faithful. I returned home from the conference excited about UCS, because at my day job we were in the process of jumping head-first into virtualization and were looking at different options for servers and storage. 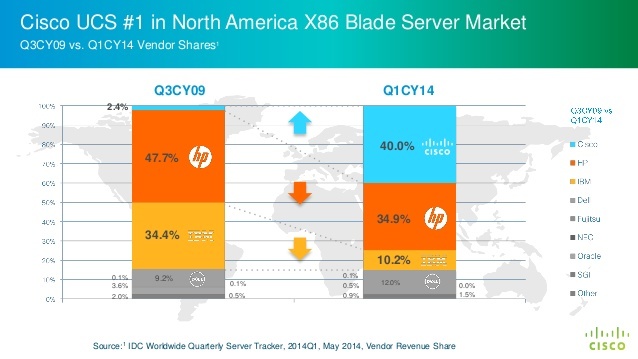 I shared my enthusiasm for UCS but was told Cisco would never touch HP or IBM in market share for servers. We bought Dell. In just 5 years, Cisco UCS has vaulted to the #1 spot in the Americas(40.9%), and #2 Worldwide (26.3%) for x86 Blade Servers, according to the IDC Worldwide Quarterly Server Tracker for 2014Q1. HP has fallen from 47.7% to 34.9% in that time. IBM has plummeted from 34.4% to 10.2% in that time. 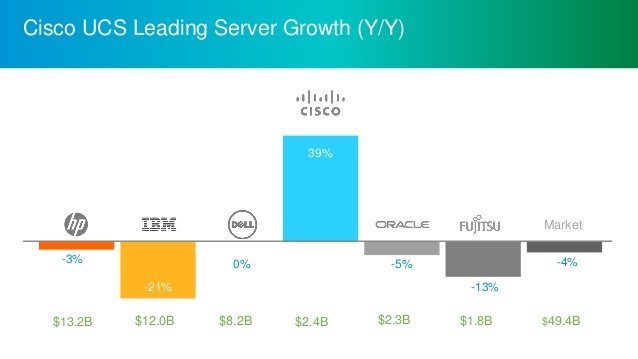 Also according to the IDC report, Cisco has the highest industry growth in the total worldwide server market, with 39% revenue growth on a cumulative four quarter basis ending in 2014Q1. This, while HP, IBM, Dell, Oracle, and Fujitsu all report flat or declining results. Cisco UCS also presently holds 94 performance benchmark records. 5 years after launch, and 4 years after Mr. Seidl’s bold prediction that UCS would be dead in a year, the numbers reveal the truth of the success of the UCS platform. Cisco UCS has established itself as a key player in the enterprise server market, not only in the Americas, but Worldwide, and growth continues every quarter as the Cisco UCS product team continue to drive innovation and performance within the platform. Cisco’s UCS business unit deserves a round of applause and a lot of credit. The numbers don’t lie, but I’d still really like to ask Randy Seidl what he thinks of those numbers. © Rob Coote and Network Canuck, 2012-2016. Unauthorized use and/or duplication of this material without express and written permission from this site’s author and/or owner is strictly prohibited. Excerpts and links may be used, provided that full and clear credit is given to Rob Coote and Network Canuck with appropriate and specific direction to the original content. At the intersection of technology and education. Where servers, storage and networking combine to form Voltron.